Hello! 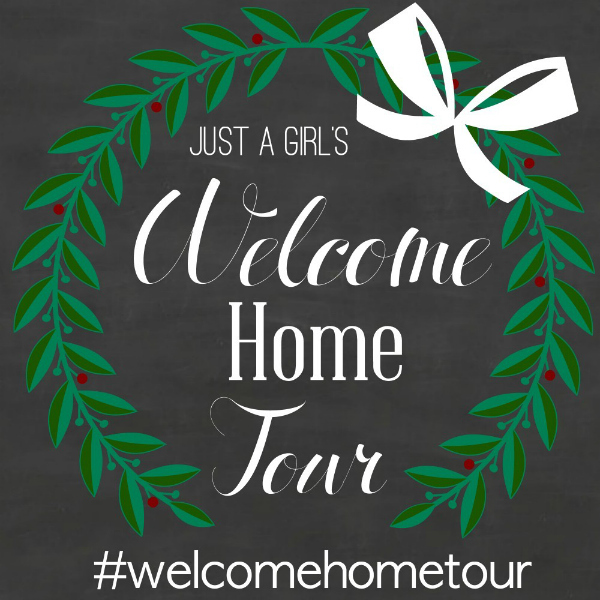 I’m so glad you stopped by for our Welcome Home Tour hosted by Chris from Just a Girl. 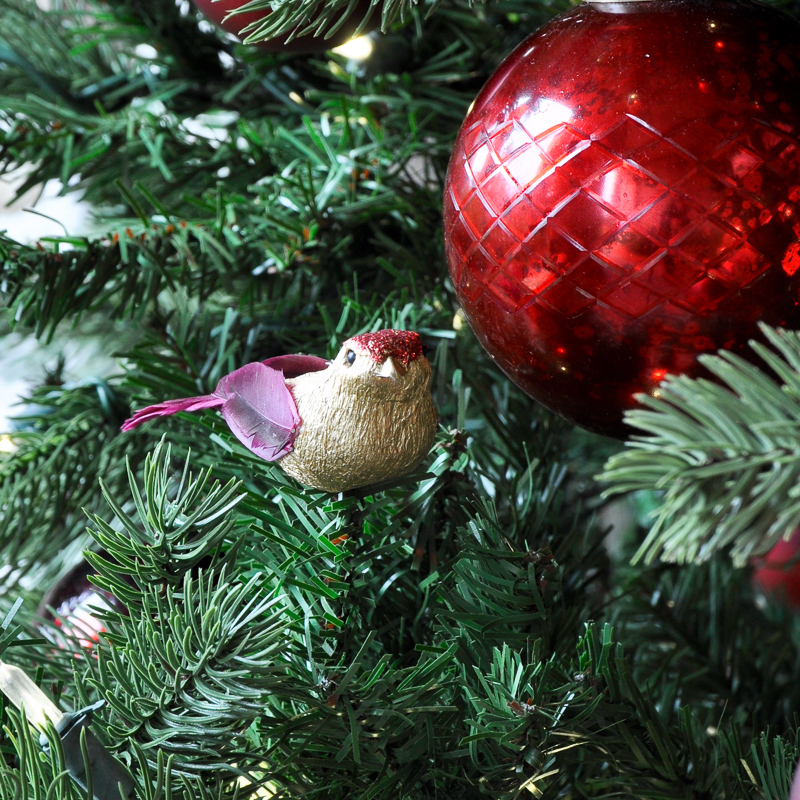 Chris was kind enough to feature my Christmas bedroom last year before I had a blog. She also encouraged me to start one, and here we are today! If you are coming from Home Made By Carmona, a special welcome to you! Yesterday evening I took a stroll down my street and realized a few things. About 90 percent of the homes have lights on them. About 60 percent of them have the front yard decorated. 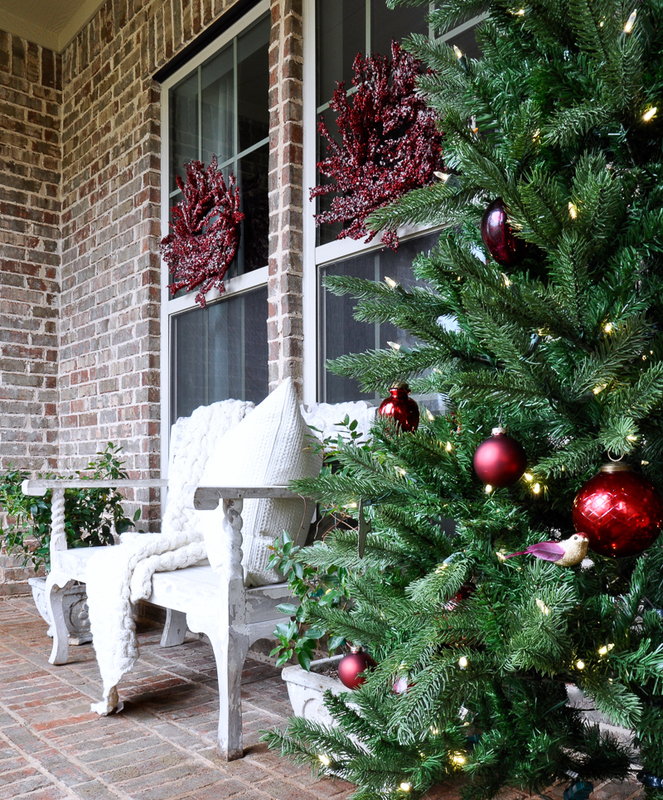 But, a festive Christmas porch has become forgotten to a certain extent. Let’s change that, shall we? Grab a cup of coffee or hot tea and allow me to share my porch with you. First, here’s a peek inside while standing in the front doorway. 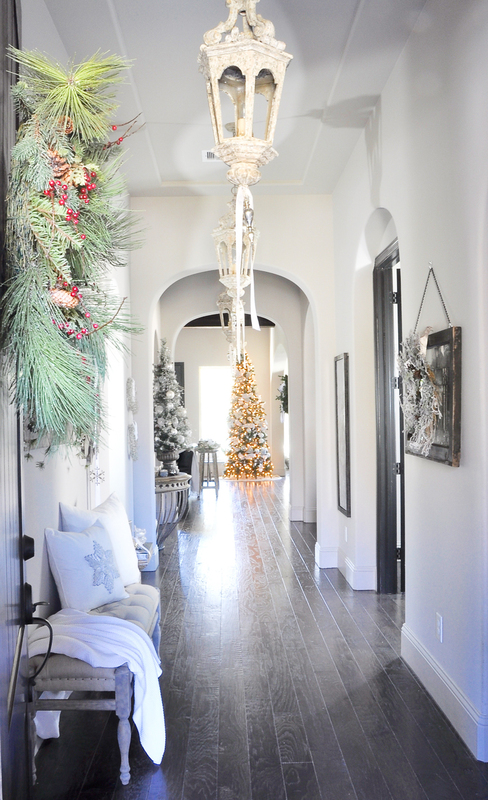 You can find my Christmas Entry Hall here. However today, I’d like to focus on the outside. This is the view as you step onto my front porch. This floor plan had several elevation choices and we chose the one with the largest porch. 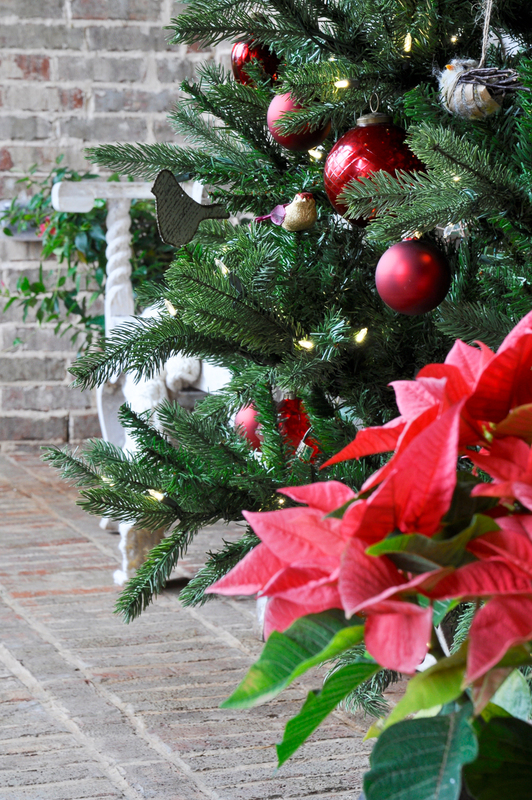 I added the classic Christmas plant, the Poinsettia, to my vintage urns and I absolutely adore them. 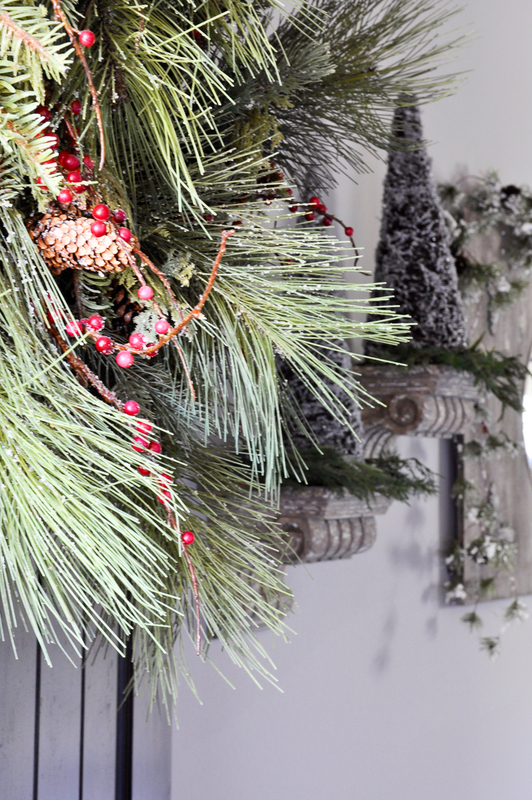 They help any space become more festive and joyful. 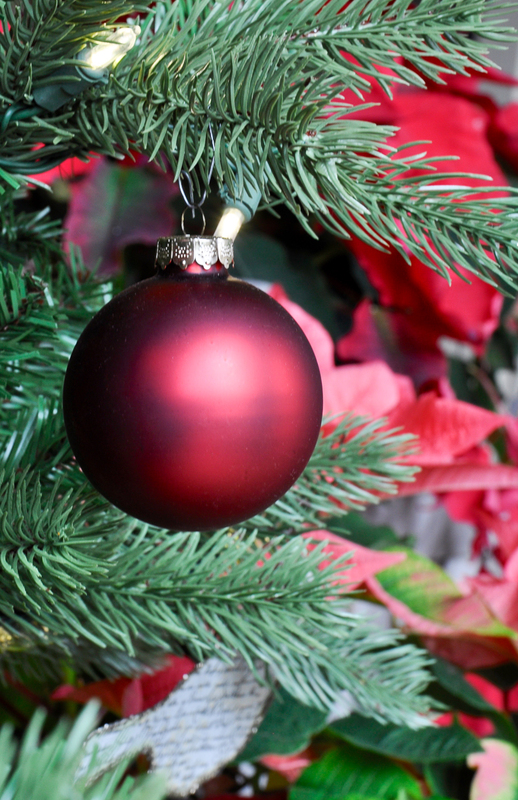 For many years, I used red ornaments throughout the inside of my home. When we decided on a neutral palette for this home, I chose to move them to the porch and I’m so glad I did. We were fortunate to get a few new Christmas trees this year. Therefore, I decided to use this older one on the front porch. You can view my new trees here. The color palette of red, green and white offers a classic and traditional look for this space. The warm climate in Houston means plants are still healthy well into December. Below you will see some Mandevilla plants which were relocated from my back patio. 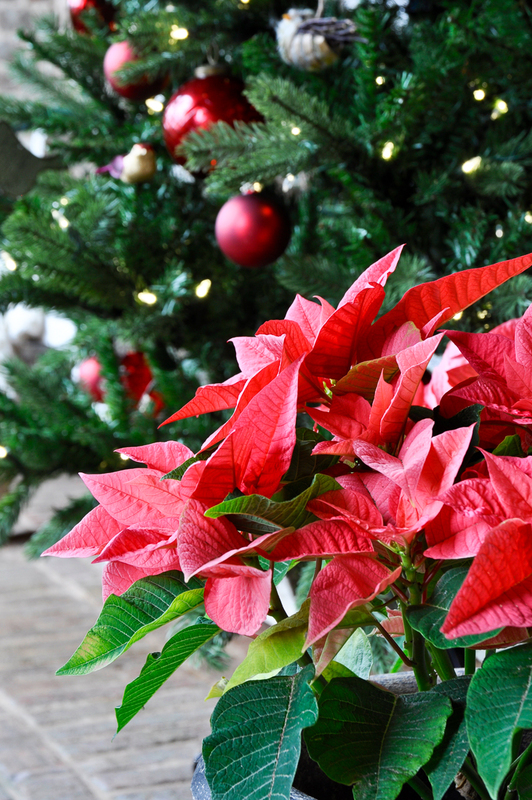 I love their festive red flowers. 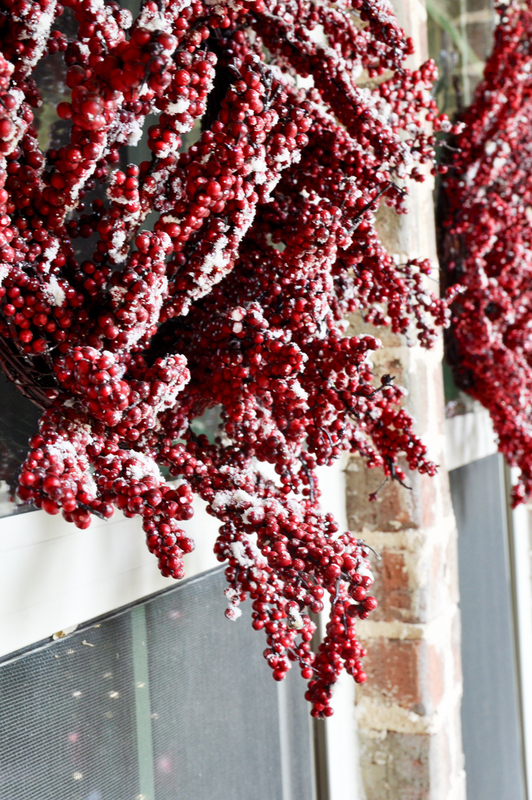 We have used these frosted red berry wreaths for several years now. They add the perfect touch to this space. 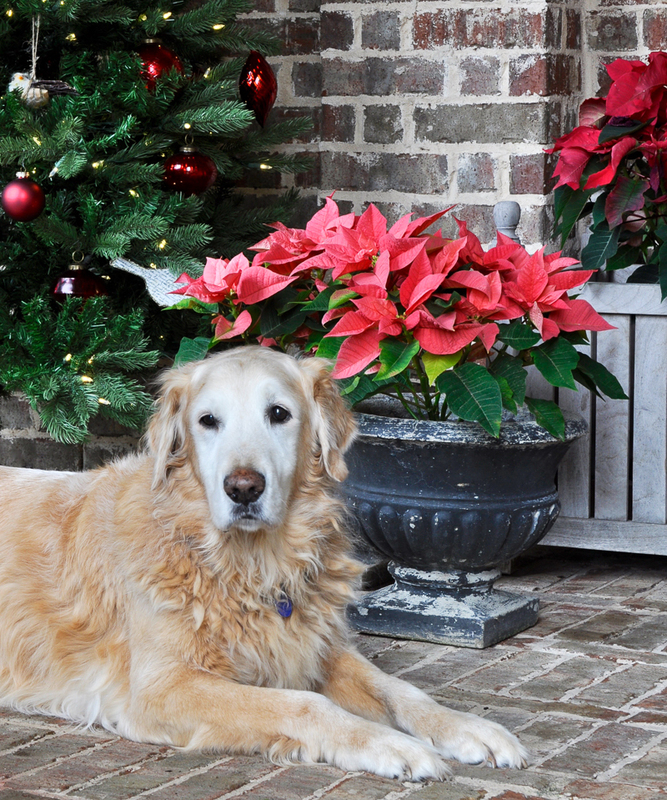 No matter where I am in the home, one of our golden retrievers plops down right when I am shooting pictures. These are blessings and I think Max is quite photogenic! 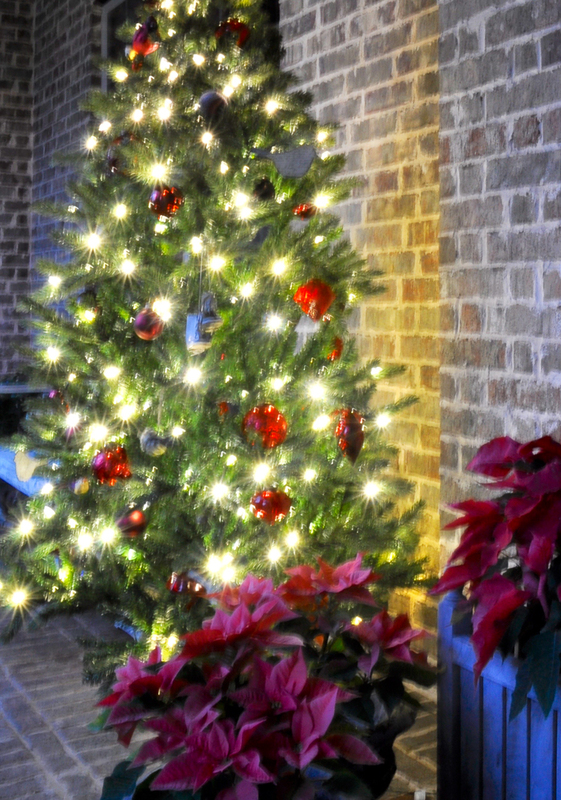 Lastly, a quick shot of the front porch tree at dusk. So, when you bribe your spouse to decorate the front yard, don’t let them forget about the front porch. It’s the Christmas greeting for your guests once they arrive at your door step. 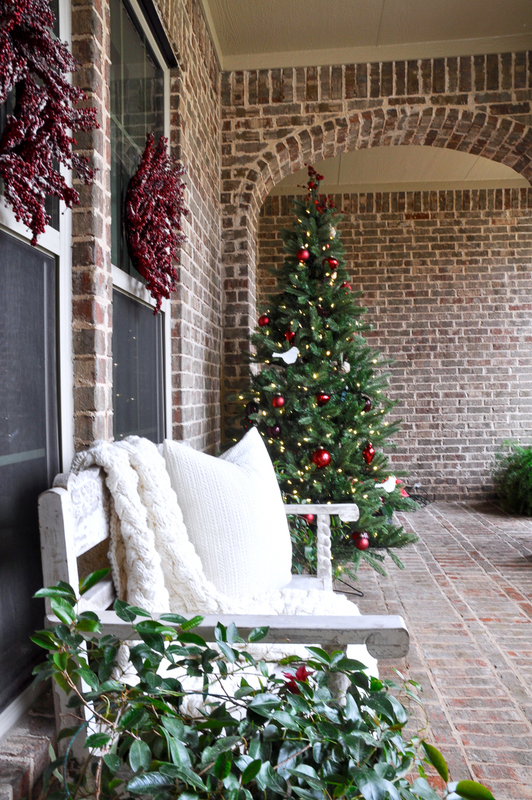 Hope you enjoyed this quick tour of my festive Christmas porch. You can find links to the interior of my home below. Happy decorating! Next stop Centsationalgirl!!! You will love her porch! This was so fun seeing your front porch Jen! I love all the brick and Max is looking pretty cute and relaxed. Merry Christmas!! Loving your Golden! <3 And that hallway stops me in my tracks every time! What lovely decor! 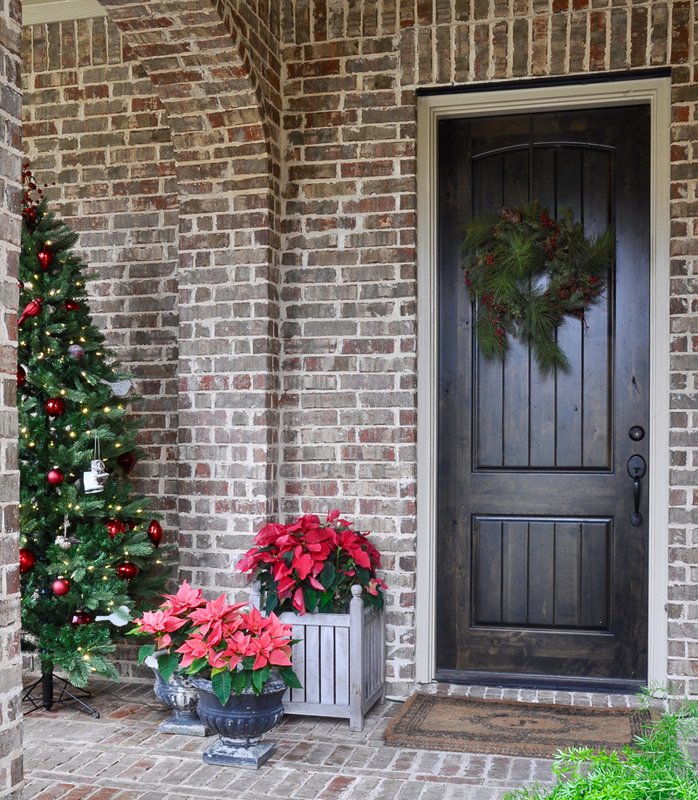 I especially love those frosted red berry wreaths!